During the first examination, the Denturist will assess the condition of your oral tissues and bone structures for any anomalies that may affect your denture treatment. At the time of the consultation, it is important for you to express all of your questions, concerns and wishes to the Denturist regarding your denture treatment. The preliminary impression is primarily designed to expose the oral structures in your mouth which should be covered with your new dentures. 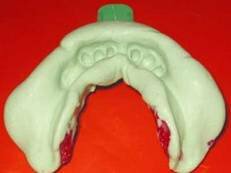 Dentures constructed on these impressions alone may require a few more post insertion adjustments, as the extensions may not be as accurate as those obtained from final impressions. 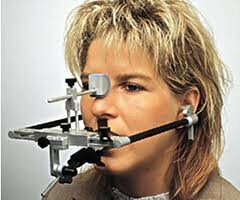 Final impressions are done to increase the accuracy of the fit and shape for your new denture bases. Finals are obtained by using a custom fit impression tray, and very sensitive impression materials. Fewer post insertion adjustments are needed as a result. ** In both the preliminary and final impressions, accurate models will be constructed of high grade dental stone. This will ensure that the exact shape of your oral structures is maintained. The bite registration is a measuring appointment. This appointment is very important in ensuring the proper fit of your dentures. The method used at our clinic is the Intra-Oral Pin Tracing method. Intra-oral pin tracing is the most accurate method of positioning and relating the upper and lower jaws. This method takes extra time and material to complete, however, the extra effort dramatically reduces the number of post insertion adjustments needed. If you have questions regarding the bite registration, please discuss them with the Denturist. This is extremely important because it can be very disappointing to a denture wearer when their new dentures do not feel or function like their old ones. This situation is temporary as you will adapt to your new “bite” in time. Remember it has taken years for you to acquire your present “bite”. You must be patient and allow your mouth to adjust to the new dentures. 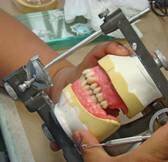 This phase of the denture construction can be the most enjoyable for both the Denturist and the denture wearer. Although enjoyable, it is also a critical phase where a great deal of responsibility is placed on the client. The Denturist will check “the bite” registration to ensure that all of the measurements are correct. At this time, phonetic clearance (speech check) will also be observed. The client must then decide whether the color, size and arrangement of the teeth meet with their approval. You can assist the Denturist in obtaining the results you want by expressing your likes and dislikes about your previous dentures. We also encourage you to bring along someone that you trust for a second opinion. This person will help to recognize and recommend changes to improve the appearance of your new dentures. Important to remember: Once all the changes have been made and you and the Denturist are in agreement; you will be asked to sign for acceptance before completion. It is important that you communicate any changes you would like at this point, as this is the last stage that changes can easily be made. Failure to inform the Denturist about any dissatisfaction with the appearance of the denture before completion will result in further expense. 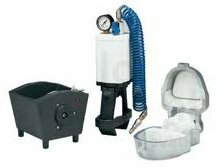 The North Hill Denture Clinic uses the Densply Success Injection System and the SR Ivocap Processing System to complete your dentures once you have accepted the wax try-in. While under constant pressure, the base of your new denture is injected with a high impact non- allergenic resin. This process maintains the accuracy achieved by the Denturist assuring the greatest fit and function for your new dentures. If you have additional questions about procedures, contact us today!